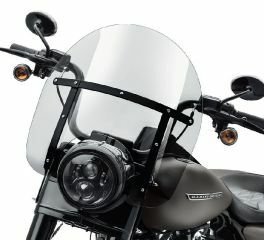 Take charge of the wind by choosing the right Harley-Davidson windshield. From Super Sport, to Compact, to King Size, the amount of wind you experience is up to you. 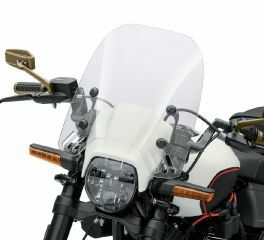 To maximize your options, choose a Ventilator Windshield or detachable model. Style meets function. 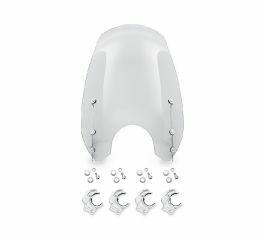 This 5.5" tall Windshield stands 4” taller than the Original Equipment Sport Glide wind deflector to offer sport styling with a little greater wind protection. 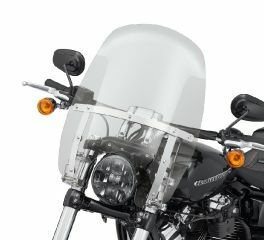 Designed to be installed or removed without tools in seconds, a detachable windshield gives you the freedom to define your ride at the drop of a hat. 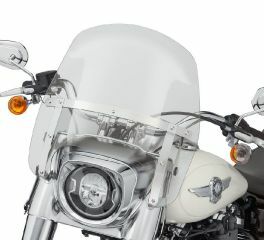 Ride across the country protected from the elements, then quickly remove the windshield to hit the streets in style. Nothing gets past this one. 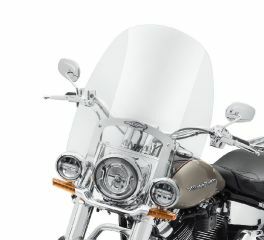 The King Size windshield is the ultimate in on-road protection. 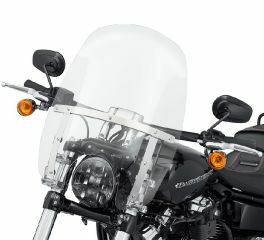 This full coverage shield creates a clean managed flow of air over and around the rider and passenger, and because it is designed to be installed or removed in seconds without tools, a detachable windshield gives you the freedom to define your ride at the drop of a hat. 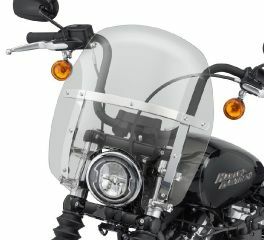 Ride across the country protected from the elements, then quickly remove the windshield to hit the streets in style. 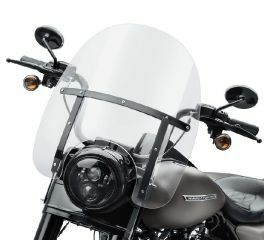 Shaped to divert headwinds around the rider, this compact windshield moderates the air pressure against your chest and reduces the strain on your arms during a long highway ride. 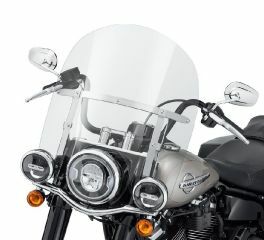 Designed to provide the riding comfort of a larger windshield, this Wind Splitter Windshield features flipped upper edge to manage the airflow and turbulence across the top of the shield. 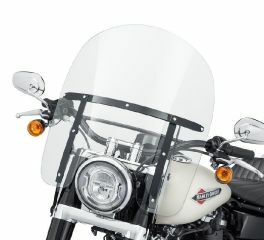 The flip adds additional wind shear lift to provide the protection of a taller wind screen. 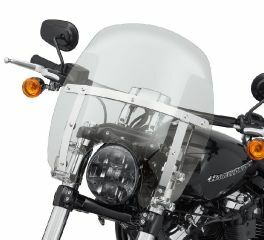 Engineered to provide the riding comfort of a larger windshield, this Wind Splitter Windshield features a contemporary contour that sets it apart from the crowd. The compact shape is designed to keep the windshield below your line of sight so you don’t need to look through bugs and road grime, while the flipped upper edge manages airflow and turbulence across the top of the shield. The flip adds additional wind shear lift to provide the protection of a taller wind screen. 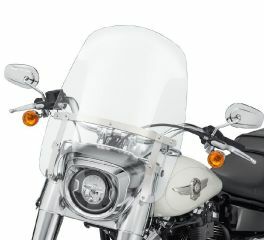 Shaped with just the right mix of width and height to reduce the pounding air pressure against your chest, the Wind Splitter Super Sport Windshield allows you ride comfortably while maintaining the wind-in-the-hair feeling. 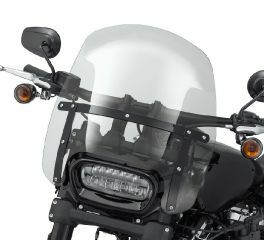 The windshield’s contoured design incorporates a flipped upper edge that manages airflow and turbulence across the top of the shield. 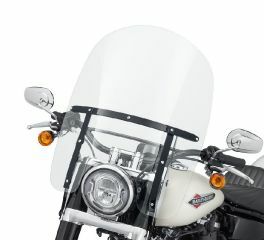 The flip adds additional wind shear lift, and effectively provides the protection of a taller wind screen. Whether it’s for keeping bugs off your face or warmth in your body, a windshield has a huge impact on rider and passenger comfort. By diverting air pressure past your chest and over your helmet, a windshield adds hours of time in the saddle by reducing the fatiguing strain on your neck and arms. A windshield provides a barrier between the rider and errant bugs, discarded cigarette butts, flying debris and bad air. 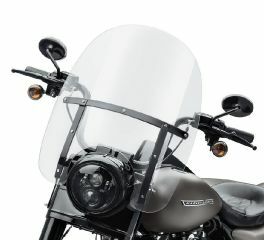 The shield manages airflow and wind blasts to create a pocket of still air for both rider and passenger comfort. But it’s not just about function. 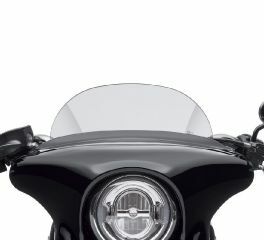 This one-piece windshield features a nostalgic horseshoe-shaped outer brace that is the perfect match for your classic Harley-Davidson motorcycle. 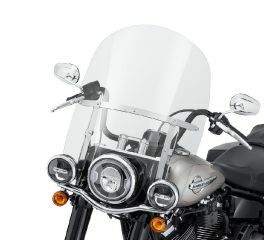 Engineered to provide the riding comfort of a larger windshield, this Wind Splitter Windshield features a contemporary contour that sets it apart from the crowd. The compact shape is designed to keep the windshield below your line of sight so you don’t need to look through bugs and road grime, while the flipped upper edge manages airflow and turbulence across the top of the shield. 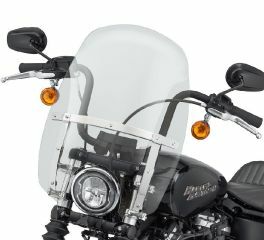 The flip adds additional wind shear lift to provide the protection of a taller wind screen. You get a fatigue-free highway ride with reduced pressure on your chest and arms, and the detachable design means you can ride without the shield when the mood strikes.